Preparation makes a lot of difference when you’re setting out to run any game. Greater minds than I have spent a lot of time writing on the subject. Gamers can find much advice on the matter scattered amongst guides, short essays and those parts of a game’s core book dealing with GM skills. 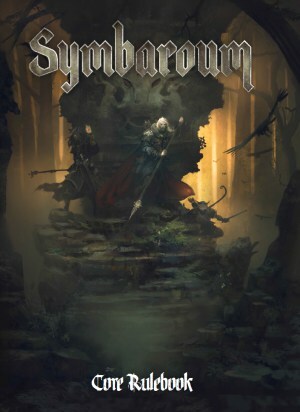 I mentioned this in passing in my recent review on Geeknative of Symbaroum. While reading The World of Symbaroum chapter, make notes. I firmly believe you’ll want (need?) to create one or more webs / mind map when you’re preparing to run a game of Symbaroum. Ideally, set a piece of paper down beside you while you’re reading. The setting chapter contains a brief discussion of individuals, factions, domains, locations and more. Brief and filled with names. Reading without anything to take notes on I just let them slide over me. Writing a review of the game – by considering the content of the book and discussing the setting with friends – didn’t warrant my spending time giving it further thought. However, I’m certain to really make Symbaroum sing you’ll want to have your setting in good order. It reminds me of Warhammer Fantasy Roleplay‘s Enemy Within campaign. Just not quite that complicated. EW really took power and politics to another level, notably in Power Behind the Throne. The relationship described between bloodlines and families in Ambria warrants a map of connections. The text describes the attitude of many noble heads to their Queen; in turn, that likely creates a bunch of undeclared sub-relationships. A family strongly wed to the cause of Queen Korinthia could easily have issues with those families showing any disregard for her authority. Families with strong connections to the Church of Prios and the Curia will oppose the acts of the Apostate Sarvola – while those of less obvious faith might waver in their opinions, likely driven by other aims. More significant for adventurers are attitudes toward Lastifer Nightpitch in Thistle Hold and the splinter sanctuary of Blackmoor. The state of affairs impacts explorers into Davokar because available work and support could depend on the attitude of the Mayor. Do they tolerate Nightpitch’s efforts to develop the vitality and support in Thistle Hold through controls and taxation, or opt for the apparent freedom of Blackmoor, despite obvious links to the underworld, non-human factions and machinations of House Erebus. I read this chapter seeing potential but realising it warranted time and effort I couldn’t spare. When I run the game I will certainly find the time – and also, give greater consideration to the timeline that tantalises the reader with the brief mention of key events. The kidnap and imprisonment of Queen Korinthia by the Darklords – what happened in the two years they held her? Does she really wear a mask because of the scars sustained in her rescue, or is there so much more behind it? How did her loyal supporters go about finding her – what steps did they take? What defeats and losses did they suffer? What sacrifices did they make to secure information on the whereabouts of the Queen and the entanglements that secured her? Webs within webs. Wheels within wheels.